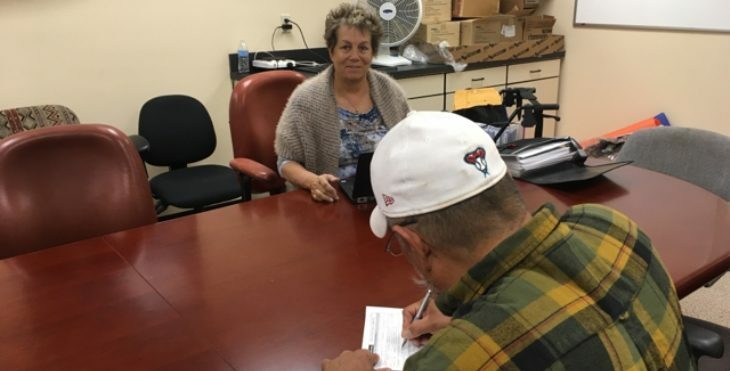 Employees with the Phoenix VA Health Care System teamed up with the Veterans Benefits Administration and Veterans service organizations to hold an outreach event for Native American Veterans on the White Mountain Apache Reservation, Nov. 14. The event is the result of a request from a local leaders from the reservation approached Phoenix VA staff at a town hall about holding an outreach event for Native Veterans. Villegas said he suggested the VA hold a formal event and bring resources to Native Veterans. He, along with the Phoenix Chief of Staff Dr. Maureen McCarthy and Associate Director Michael Welsh, coordinated with VA staff, VBA and the VSOs to host the event a week after the town hall. The team saw roughly 40 Veterans and dependents who sought help or resources. Landry wasn’t alone in her enthusiasm to help the Veterans. Villegas said he believes the outreach event met the intent and expectations of the council woman who initiated the request and her tribe, adding that the event wouldn’t have been possible on such short notice without the willingness of employees to volunteer to host the event. He said the VSOs and social workers were instrumental to the event’s success. Villegas said they also provided the Veterans with a lot of resources to include letting them know that the VA offers a shuttle from their reservation to the Show Low clinic. The reservation is located roughly 25 miles from the clinic; however, Villegas explained that many Native Veterans won’t pursue services because there are cultural barriers that prevent them from seeking help. Therefore, despite the reservations’ relatively proximity to the clinic, VA leadership has identified the need to host future outreach events at the reservation to help provide services to more Veterans. Dates for future outreach events on the White Mountain Apache Reservation have not been formalized, yet; however, future events will likely use the mobile medical unit to provide even greater service to the Veterans. About the author: Macario Mora is a public affairs secialist for the Phoenix VA Health Care System.